LDV needs funds to make an electric version of the Maxus van. The UK van manufacturer LDV has asked the British government for emergency loans to help fund a management buyout from Russia's Gaz Group. Gaz, which bought LDV in 2006, has said it supports the buyout because it cannot support the ailing company any longer. LDV is asking for £30 million (34.2 million euros) for short-term funding to help it become the first big producer of electric vans in the UK. Short-term financial support from the UK government for the buyout will secure LDV's future and hundreds of jobs, LDV said. Gaz chairman and former Volvo executive Erik Eberhardson is leading the plan. "LDV can be a symbol of the low carbon, green manufacturing future that the government says it wants Britain to lead," Eberhardson said in a statement. He said the company was "almost ready to go, but we need the government to do its bit." LDV has been hit hard by the global downturn. Sales in the van sector have almost halved during the past three months, LDV said, forcing the company to shut down production at its plant in Birmingham, central England, on December 12. Eberhardson told BBC radio: "Since the company is not producing, it is not making enough revenue to cover its costs. The company is literally running out of cash." 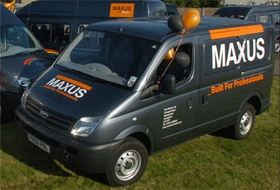 The first electrically-powered versions of the Maxus van will be launched within a year, LDV marketing director Guy Jones told Automotive News Europe. "We have a strong plan but normal lines of funding through the banks are proving temporarily difficult. We need to find funding," Jones said. LDV employs 900 people at its Birmingham factory. It supports a further 5,000 jobs at supply companies and 1,200 through its dealer network. The company was originally called Leyland DAF Vans. It was formed through a merger between DAF Trucks and the van division of the British Leyland Rover Group.